Mice with fibroblast-specific expression of TAP-1 were generated by expressing the TAP-1 transgene under the control of the fibroblast-specific protein (FSP) 1 promoter/enhancer on TAP-1-deficient background. MHC class I expression in primary fibroblast cultures isolated from the resulting strain mimicked that of wild-type counterparts. MHC class I was detected in both types of fibroblasts following treatment with IFN-αβ. Positive selection of CD4−CD8+ thymocytes was observed in neither adult nor fetal/neonatal thymus of transgenic mice. IFN-αβ-induced expression of MHC class I rescued positive selection of CD4−CD8+ T cells in fetal thymic organ cultures, but not in adult mice. Contrary to previous suggestions, our results indicate a limited role of fibroblasts in promoting positive selection. In addition, the results suggest that positive selection may occur by a different mechanism in fetal vs adult thymus. During differentiation in the thymus, immature T cells undergo positive selection (1, 2). This process is based on the interaction of their TCR with self-peptide-MHC complexes presented by thymic stromal cells. Identification of thymic stromal cells that promote positive selection has been recognized as a key to understanding this process and has therefore been extensively studied. A variety of approaches has indicated that thymic epithelial cells are the major cell type influencing positive selection (3, 4, 5, 6, 7, 8). The crucial consideration was: are cortical epithelial cells specialized for promoting positive selection, or can this function be ascribed to their unique anatomical positioning? Major support for the latter notion was provided by studies suggesting that fibroblastoid cell lines can induce positive selection following intrathymic injection as efficiently as thymic epithelial cells (9, 10). However, in the fetal thymic reaggregation cultures, fibroblasts were not able to promote positive selection of thymocytes in the absence of thymic epithelial cells (8). These disparate results could be explained by possible injection of fibroblasts into an anatomically incorrect microenvironment. Furthermore, the numbers of injected fibroblasts likely exceeded normal representation of this cell type, and expression of MHC molecules by the injected cells was ectopic. On the other hand, the thymus reaggregation experiments might have exposed the unique (dis)abilities of neonatal fibroblasts and/or thymic epithelial cells. In addition, the possibility that deaggregation/reaggregation procedures might have selectively disabled certain properties of particular cell types cannot be excluded with certainty. In this study, we present a strategy that bypasses the difficulties encountered in previous approaches. Transgenic mice expressing TAP-1 under the fibroblast-specific protein (FSP)3 1 promoter/enhancer (11) were generated and bred to the TAP-1-deficient mice (12) to produce mice with fibroblast-selective expression of TAP-1. Studies of thymic selection in these mice are not limited to any stage of development (neonatal or adult) and microanatomical distribution of fibroblasts, as well as all other thymic cell types, should not differ from wild type. Finally, the levels of MHC class I in these mice should not be supraphysiological, as the levels of other molecules involved in MHC class I assembly (class I H chain, TAP-2, and β2-microglobulin) should be limiting for the potentially excessive expression of transgenic TAP-1. The FSP-1 promoter/enhancer (11, 13) was flanked at the 5″ end with cDNA encoding mouse TAP-1 (supplied by Dr. J. J. Monaco, University of Cincinnati, Cincinnati, OH) and the exon-intron sequence of the human β-globin (Fig. 1⇓A). DNA injection into C57BL/6 fertilized eggs was performed at the New York University School of Medicine transgenic facility. Six founders were identified by Southern blotting of tail DNA using the BamHI-EcoRI DNA fragment (0.9 kb) from the human β-globin gene as a probe (Fig. 1⇓B). Southern blot and detection of fluorescein-labeled probes were performed using the Gene Images CDP-Star detection module (Amersham Pharmacia Biotech, Piscataway NJ). All founders were bred for two generations to TAP-1−/− background to obtain FSP-1 promotor-specific TAP-1 expression (FSTE) mice. Mice were screened by a combination of peripheral blood staining for H-2Kb (for TAP-1 deficiency) and Southern blotting and/or PCR of genomic tail DNA with primers specific for the transgenic construct, sense = 5′-GCGGCTCCTGCAGACTGA-3′; antisense = 5′-CTGATGCAATCATTCGTCTG-3′. TAP-1−/− mice were purchased from The Jackson Laboratory (Bar Harbor, ME). C57BL/6 and H-Y TCR transgenic mice were purchased from Taconic Farms (Germantown, NY). Generation of FSP-1/TAP-1 transgenic mice. A, Schematic representation of the FSP-1/TAP-1 construct. TAP-1 cDNA was placed under the control of a FSP-1 promoter-containing DNA segment. The human β-globin gene fragment (□) providing two introns (▪) and a polyadenylation signal ([▨); restriction sites shown in parentheses have been destroyed by blunt-end cloning. B, BglII; BH, BamHI; E, EcoRI; S, SalI; Sp, SpeI. B, Southern blot analysis of EcoRI-digested tail DNA from transgenic offspring. The transgene is indicated by the 2.1-kb band. Southern blot analysis was performed using a probe containing a portion of the human β-globin gene. This blot shows the analyses of wild-type C57BL/6 control (lane 1) and three offspring mice (lanes 2–4), of which one shows positive. To obtain primary fibroblast cultures, small pieces of skin from tails or spleens were plated in RPMI 1640 (10% FCS) without growth factors. Debris was removed after 1 wk and the adherent cells were trypsinized and expanded. By day 15, only fibroblasts were growing. We were able to subculture these fibroblasts for >30 doublings. Some fibroblast cultures were treated for 2 days with 500 U/ml IFN-αβ (gift from Dr. D. Levy, New York University School of Medicine). All mAbs were purchased from BD PharMingen (San Diego, CA). Fibroblasts were stained with an anti-H-2Kb-specific mAb (Y3) on ice for 30 min, washed in PBS (containing 1% BSA) followed by FITC-conjugated anti-mouse Ig for an additional 30 min. Thymocytes were stained using anti-mouse CD4-PE, CD8-CyChrome, and CD24-FITC. Cells were fixed in 1% paraformaldehyde and analyzed using FACScan (BD Biosciences, Mountain View, CA). Total RNA was isolated from 5 × 106 cells using TRIzol reagent (Life Technologies, Gaithersburg, MD) following the manufacturer’s protocol. cDNA was synthesized using the SuperScript One-Step RT-PCR with Platinum Taq (Life Technologies). PCR was conducted using PCR SuperMix (Life Technologies). Amplification was conducted with primers specific for H-2Db and β-actin (14) and for TAP-1, TAP-2, and low molecular weight protein 2 (LMP-2) (15). FTOC was performed as described previously (16). H-Y TCR transgenic mice in TAP-1−/− background were bred with FSTE mice. The thymic lobes were removed from animals at gestational day 16 and placed on sponge-supported filters (Millipore, Bedford, MA) in medium with or without 500 U/ml IFN-αβ. Cultures were arranged so that one lobe was treated with IFN-αβ, while the other lobe from the same fetus was treated as control. After 10 days, thymocytes were harvested and analyzed by flow cytometry. Fetuses were screened by PCR of genomic DNA with primers specific for the TAP-1 transgene (described above) and the H-Y transgene, sense = 5′-AGGAGGAAACAGTGCCCAGTCCGT-3′; antisense = 5′- CGCAGACCCTCCTTGATCCTGGCC-3′. To determine expression of the transgene, adult skin fibroblasts were isolated from F1 offsprings of transgenic founders and TAP-1−/− mates. RT-PCR was conducted using primers from the mouse TAP-1 (forward) and human β-globin (reverse) sequences 477 bp apart (Fig. 2⇓A). Mice that expressed the transgenic mRNA were further bred onto the TAP-1−/− background. To analyze MHC class I expression, primary embryonic or adult fibroblast cultures from wild-type (C57BL/6), FSTE, and TAP-1−/− mice were established and analyzed by flow cytometry. MHC class I molecules were not detectable irrespective of the source of fibroblasts (Fig. 3⇓ and data not shown). To determine whether the transgene is functionally expressed in FSTE fibroblasts, we treated primary culture fibroblasts with IFN-αβ. After this treatment, FSTE as well as wild-type fibroblasts expressed readily detectable levels of MHC class I (Fig. 3⇓). 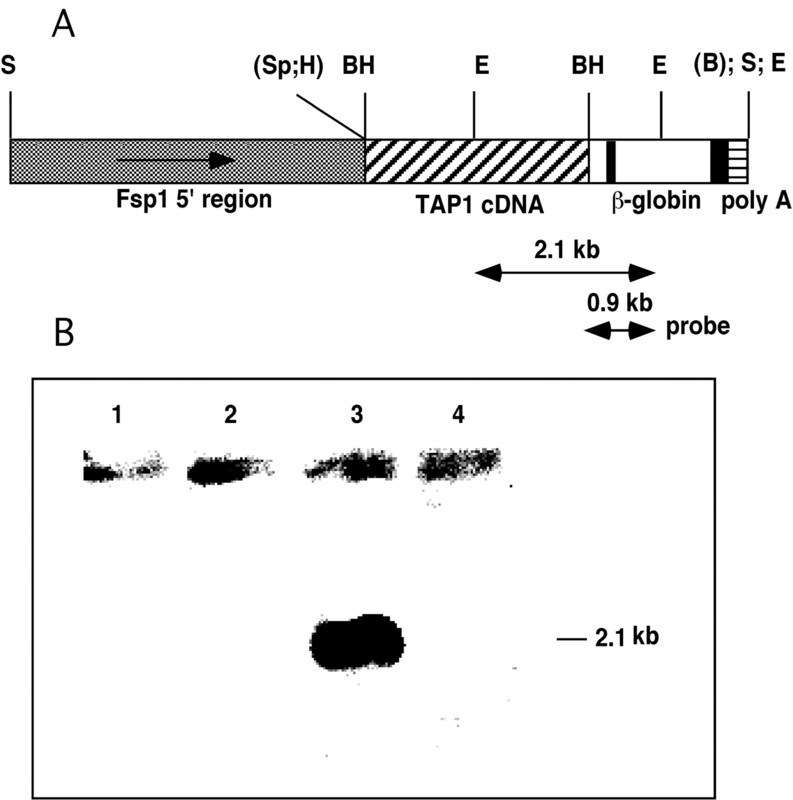 FSP-1-driven expression of TAP-1 transgene. A, RT-PCR analysis of TAP-1 and β-actin expression in in vitro cultured skin fibroblasts. Two transgenic offspring are shown, one expressing (lane 1a) and one not expressing (lane 2a) the product. Lanes 1b and 2b represent PCR using templates obtained in the absence of reverse transcriptase. 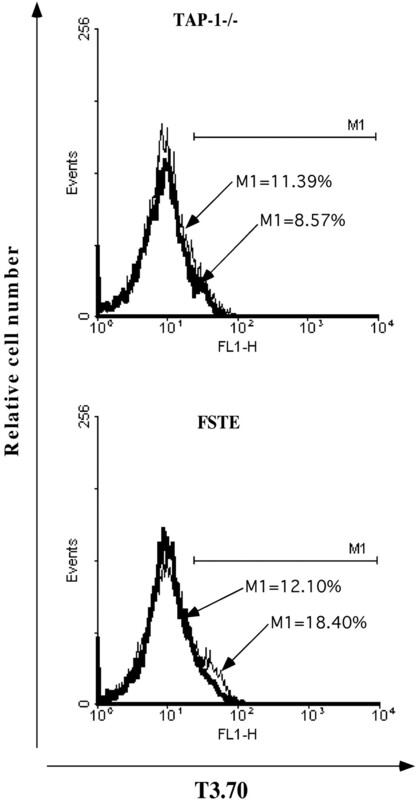 B, cDNA from indicated cell equivalents was isolated from FSTE untreated or IFN αβ-treated (500 U/ml for 2 days) neonatal fibroblasts and used as a template for RT-PCR for molecules involved in MHC class I assembly. IFN-αβ induces MHC class I expression in FSTE fibroblasts. Immunofluorescence analysis of untreated or IFN-αβ- treated (500 U/ml for 2 days) primary embryonic fibroblasts isolated from wild-type (WTB6), TAP-1−/−, or FSTE mice. Cells were stained with anti-H-2Kb- specific mAb followed by FITC-Ig (bold lines) or secondary Ab alone (thin lines). To determine whether IFN-αβ induced expression of endogenous and/or transgenic genes involved in assembly of MHC class I, RT-PCR were performed with primers specific for MHC class I H chain, TAP-1, TAP-2, and LMP-2 molecules. 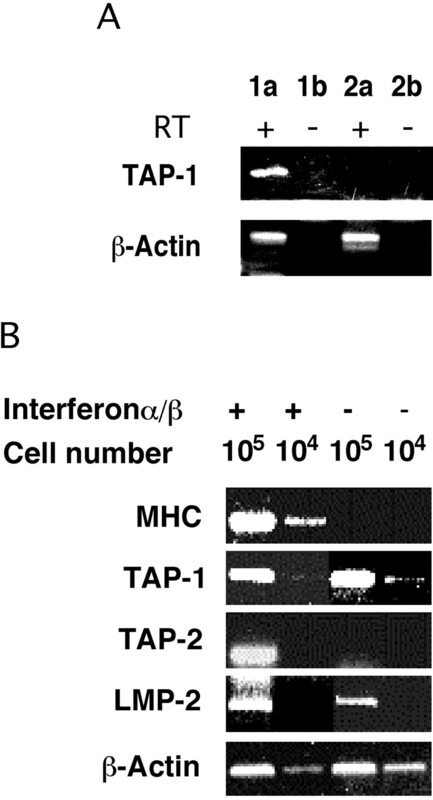 The expression of TAP-2, and especially of MHC class I H chain, depended on IFN-αβ (Fig. 2⇑B). In contrast, expression of the TAP-1 transgene driven by the FSP-1 promoter/enhancer was IFN-αβ independent. Thus, up-regulation of endogenous genes, but not of the transgene, appears to be the mechanism of IFN-αβ-mediated induction of MHC class I expression in FSTE fibroblasts. Thus, in the cell types that constitutively express genes involved in the assembly, MHC class I expression should not depend on IFN-αβ-treatment. Except for the cultured fibroblasts, we did not observe MHC class I expression in several lymphoid tissues of FSTE mice (spleen, peripheral blood, lymph nodes, or thymus; data not shown), consistent with selective IFN-αβ-inducible expression by fibroblasts. FSTE mice were tested for the presence of CD4−CD8+ thymocytes and peripheral CD8+ T cells. Immunofluorescence staining revealed enrichment in CD4−CD8+ thymocytes relative to TAP-1−/− counterparts was not observed in adult mice (Fig. 4⇓A) or 16–20 gestational day embryos. The same finding was obtained in the periphery wherein no enrichment of CD8+ spleen cells was found (Fig. 4⇓B). These findings could be ascribed to either insufficient MHC class I levels expressed by fibroblasts in vivo or to genuine inability of fibroblasts to promote positive selection. To address the former possibility, we bred FSTE mice to H-Y TCR transgenic background and asked whether fibroblasts can promote deletion of CD4+CD8+ thymocytes in male mice. The CD4/CD8 profile of FSTE/H-Y mice was identical to that of TAP-1−/−/H-Y mice (Fig. 5⇓), indicating that levels of male Ag-MHC complexes in FSTE mice are insufficient to induce negative selection. Fibroblasts from FSTE mice fail to induce positive selection in vivo. 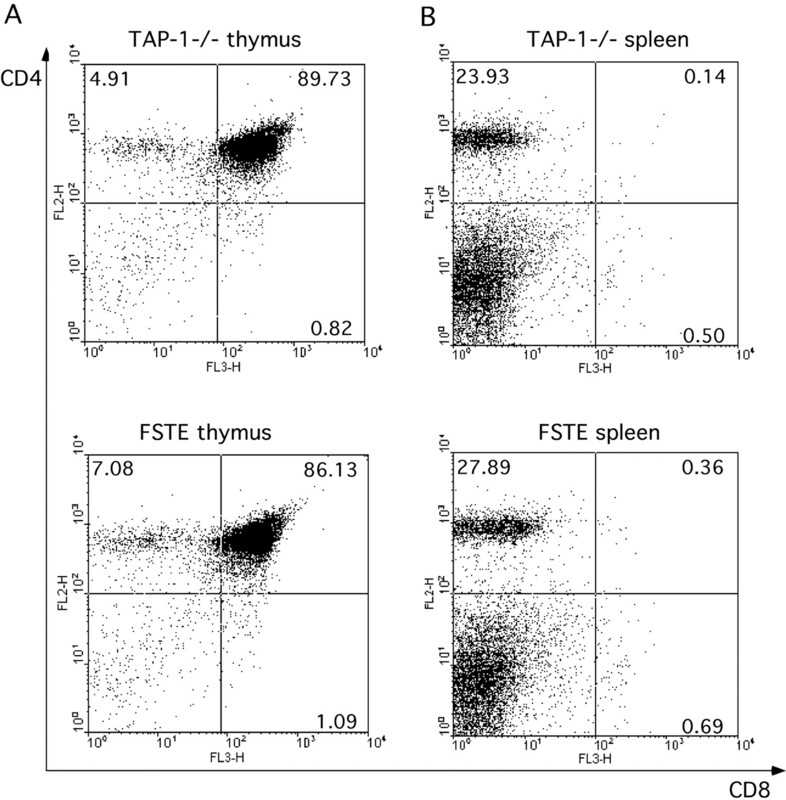 Cells isolated from thymi (A) or spleens (B) of FSTE or TAP-1−/− mice were stained with anti-CD8 and anti-CD4 mAbs and analyzed by flow cytometry. Fibroblasts from FSTE mice fail to induce negative selection in vivo. 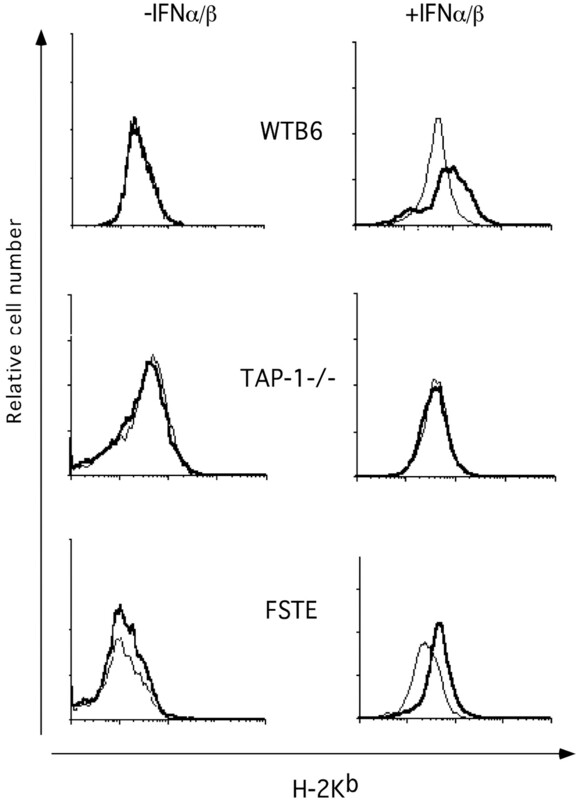 Cells isolated from thymi of H-Y TCR transgenic male mice on the wild-type (WT), TAP-1−/−, or FSTE background were stained with mAbs specific for CD8 and CD4 and analyzed by flow cytometry. 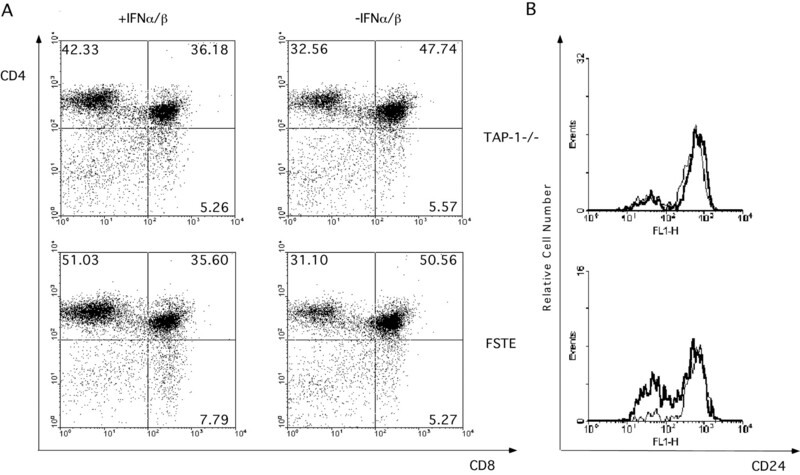 Two approaches were taken to test whether fibroblasts have the potential to induce positive selection of T cells, both based on the ability of IFN-αβ to induce MHC class I expression by fibroblasts (see Fig. 3⇑). First, FSTE mice were treated with poly(I:C), an agent that induces massive endogenous IFN-αβ secretion (17). FSTE mice were injected with poly(I:C) or PBS alone twice with a 5-day interval between the injections, and thymi from injected animals were analyzed 5 days after the second injection. However, poly(I:C) treatment could not induce positive selection of CD4−CD8+ thymocytes in FSTE mice, nor could it enhance the selection of the same cells in wild-type mice, despite increasing the levels of MHC class I (data not shown). Second, FTOCs from TAP-1−/− or FSTE mice were treated with IFN-αβ. A modest, but consistent increase in the numbers of CD24lowCD4−CD8+ thymocytes was observed in IFN-αβ-treated FSTE, but not TAP-1−/− FTOCs (Fig. 6⇓). Immature CD24highCD4−CD8+ thymocytes are more abundant in FTOCs than in the adult thymus, thus presenting a relatively high background for detection of mature CD4−CD8+ thymocytes. MHC class I-restricted TCR transgenic mice have an inverted CD4:CD8 cell ratio so that differences between positive and negative controls are more pronounced. Therefore, FTOCs were established from H-Y TCR transgenic mice on TAP-1−/− or FSTE backgrounds. 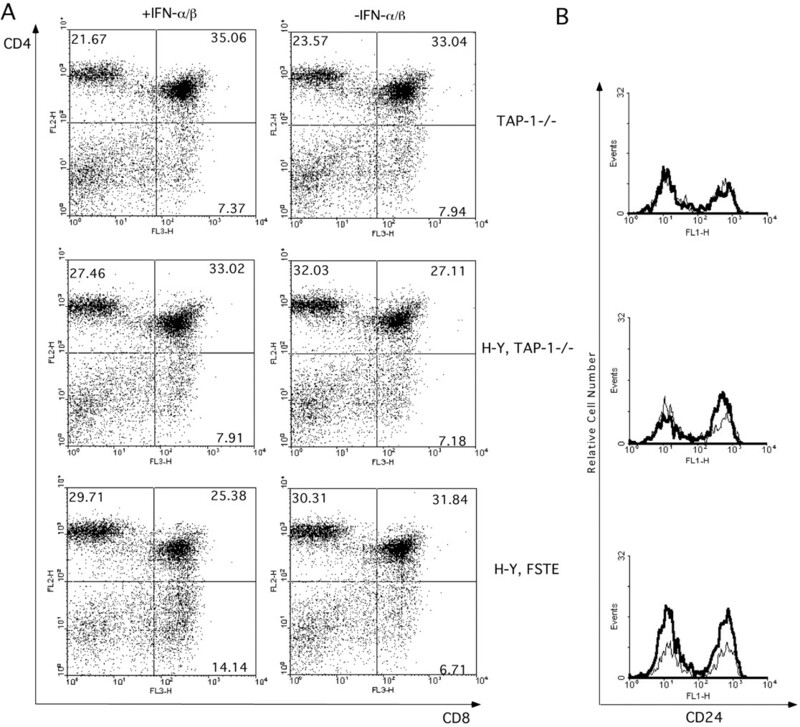 Interestingly, treatment of TAP-1−/−/H-Y FTOCs with IFN-αβ induced an increase in the fraction of immature CD24highCD4−CD8+ thymocytes (Fig. 7⇓). We do not know the reason for this phenomenon, but it is apparently related to the presence of the H-Y TCR, since non-TCR transgenic cultures showed no such increase (Figs. 6⇓ and 7⇓). When IFN-αβ-treated FSTE/H-Y lobes were compared with TAP-1−/−/H-Y lobes, a significant and selective increase in the numbers of mature CD24lowCD4−CD8+ thymocytes was observed (Fig. 7⇓). Since CD4−CD8+ and not CD4+CD8− thymocytes express high levels of transgenic TCR (18), an appearance of T3.70high cells in IFNαβ-treated FSTE, but not TAP1−/− FTOCs (Fig. 8⇓) further suggested that positive selection of mature CD4−CD8+ thymocytes occurred in FSTE IFNαβ-treated FTOCs. Collectively, these results suggest that fibroblasts have a very limited role in positive selection physiologically, but that they have the potential for supporting positive selection, at least during early ontogenesis. Positive selection of HSAlowCD4−CD8+ thymocytes in FSTE FTOCs enabled by IFN-αβ treatment. Fetal thymic lobes from TAP-1−/− or FSTE mice were cultured for 10 days in the absence or presence of 500 U/ml IFN-αβ. The cultures were set in a manner that pairs of lobes from each individual fetus were divided into control or IFN treated. At the end of the culture, the lobes were disaggregated and triple stained for CD8, CD4, and CD24. A, Shown are the CD4 vs CD8 dot plots. B, The expression of CD24 was analyzed in the CD4−CD8+ subpopulation of control (thin line) or FTOCs treated with IFN-αβ (bold line). These data are representative of four experiments with similar results. Positive selection of HSAlowCD4−CD8+ thymocytes in FSTE/H-Y FTOCs enabled by IFN-αβ treatment. Fetal thymic lobes from H-Y-specific TCR transgenic FSTE mice were cultured and analyzed in a manner identical to that in described in Fig. 6⇑ legend. A, Shown are the CD4 v sCD8 dot plots. B, The expression of CD24 was analyzed in the CD4−CD8+ subpopulation of control (thin line) or FTOCs treated with IFN-αβ (bold line). These data are representative of three experiments with the same results. TCR expression in H-Y/TAP-1−/− or H-Y/FSTE FTOCs. FTOCs were performed as described in Fig. 7⇑ legend and thymocytes were stained with T3.70 mAb. Control and IFN-αβ-treated samples are shown in bold and thin lines, respectively. Numbers represent the percentage of cells included in the indicated gate M1. To achieve selective expression of MHC class I molecules in fibroblasts, we reconstituted an essential component in the MHC class I assembly, TAP-1, in TAP-1-deficient mice. Reconstitution of TAP-1 is advantageous in comparison to expression of β2-microglobulin or MHC class I H chain (in appropriate deficient mice). The β2-microglobulin molecule does not have a transmembrane region, thereby potentially allowing its dissociation from cell surface MHC class I (19). This could create a possibility wherein peptide-class I H chain complexes on bone marrow-derived cells (or on any other cell type) could acquire cell-free β2-microglobulin and stabilize a functionally significant portion of cell surface MHC class I. This scenario is impossible with an intracellular transmembrane molecule such as TAP-1. The disadvantages to use of class I H chain are the restriction to use only one class I allele and its potential overexpression. In contrast, obtaining supraphysiological levels of MHC class I by reconstituting TAP-1 is not a serious concern. The functional TAP molecule is a heterodimer of TAP-1 and TAP-2 subunits (20) and the limiting levels of endogenous levels of TAP-2 will prevent excessive formation of the TAP heterodimer, even under conditions of potential overexpression of TAP-1. The limiting levels of β2-microglobulin and the class I H chain further ensures that normal levels of MHC class I are not exceeded. Indeed, levels of expression of MHC class I in IFN αβ-treated primary fibroblasts isolated from FSTE mice are certainly not higher than in wild-type fibroblasts. An important question is whether the undetectable levels of MHC class I in both wild-type and FSTE primary fibroblast cultures are an artifact of in vitro culture or faithfully reproduce in vivo conditions. Although it is difficult to answer this question with certainty, three pieces of information support the latter possibility. First, patterns of expression of other genes can be stably maintained during fibroblast cultures and can be quite distinct in fibroblasts isolated from different tissues (21). Second, embryonal/neonatal fibroblasts could affect positive selection after IFN-αβ treatment (Fig. 7⇑), suggesting that the absence of positive selection in FTOCs before IFN-αβ treatment was attributable to insufficient levels of MHC class I expression. Finally, we could detect no thymocyte-negative selection in male H-Y/FSTE mice (Fig. 5⇑). Positive selection appears to require at least two signals: MHC dependent that can be delivered by bone marrow-derived cells, and MHC-independent signal that requires radioresistant thymic stroma (22). Using the two-signal model of positive selection, at least three explanations could account for differences in embryonal/neonatal vs adult positive selection by fibroblasts. First, embryonal/neonatal, but not adult fibroblasts, may share with cortical epithelial cells a unique costimulation/adhesion molecular structure required for positive selection. This unique structure could possibly reflect the presence of putative positive selection-inducing molecule(s) and/or the absence of putative positive selection-inhibiting molecule(s). An example for the latter possibility would be the B7-1 molecule, which can enhance signals, leading to negative selection (23), and has a thymic distribution consistent with a putative negative effect on positive selection (24). Fibroblasts were reported to express homologues of costimulatory molecules (25), but the ability of these homologues to enhance negative selection is not yet established. Second, selection of embryonal/neonatal and adult thymocytes may have distinct requirements. This possibility thus far has little experimental support and we consider it unlikely. Nevertheless, various differences between embryonic/neonatal thymic differentiation have previously been noted, including involvement of TdT in TCR gene rearrangements (26) and maturation of regulatory T cells (27). Finally, the third possibility is that embryonal/neonatal but not adult thymic fibroblasts may be localized in the vicinity of cortical thymic epithelial cells. Thus, in the embryonal/neonatal thymus, fibroblasts may supply the MHC-dependent signal, whereas cortical thymic epithelial cells could provide the “second signal” in trans. Although the first two possibilities remain to be formally excluded, the last scenario is most consistent with existing literature that includes reports of positive selection induced by intrathymic injection of fibroblast cell lines (9, 10) or inefficient selection by bone marrow-derived cells (28, 29). In conclusion, to achieve selective expression of MHC class I molecules in fibroblasts, we reconstituted an essential component in the MHC class I assembly, TAP-1, in TAP-1-deficient mice. Results presented in this report suggest that fibroblasts appear to be unable to significantly impact on MHC-dependent aspects of T cell differentiation under physiological conditions. This, however, does not challenge the well-established role of fibroblasts in maintaining the structural integrity of the thymus and promoting earlier MHC-independent stages of thymocyte differentiation (30, 31). We thank John Hirst for FACS analysis, John Monaco for providing the mouse TAP-1 cDNA, and David Levy for providing IFN-αβ and for helpful discussions. ↵1 This work was supported by the National Institutes of Health Grants AI41573 (to S.V.) and CA83687 (to A.B.F.) and National Cancer Institute Core Support Grant 5P30 CA16087. ↵3 Abbreviations used in this paper: FSP, fibroblast-specific protein; FSTE, FSP-1 promotor-specific TAP-1 expression; FTOC, fetal thymic organ culture.